The goal was to build a website to track and display videos produced in the greater Kalamazoo area. Kzootube.com (RIP) was born out of the Public Media Network in collaboration with various other public service agencies around the city. The core of the site was built using the Django framework by the Participatory Culture Foundation. I built Kzootube.com on top of that. Unfortunately, both the site and the PCF’s software were short-lived. Still, an interesting project in community media. 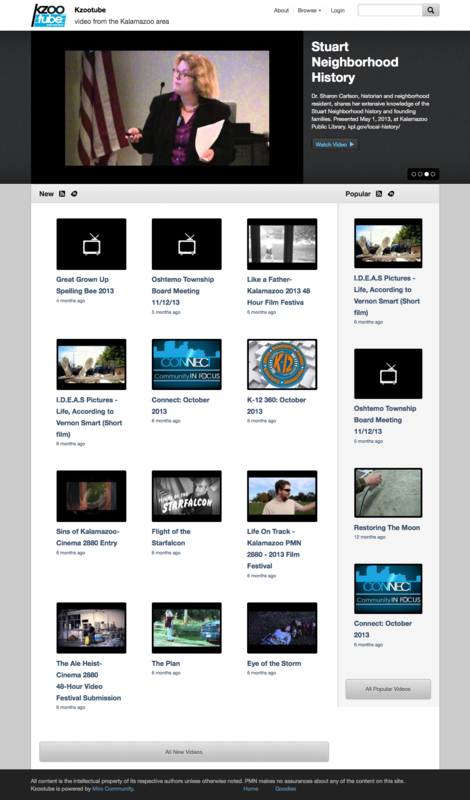 Videos were aggregated from other sites such as Youtube and then embedded directly onto Kzootube’s own pages.